In the 1960s, the world was still all about innovative transportation, a carryover from the golden days of the automobile. In the midst of figuring out how humans would get around in the decades to come, some pretty crazy ideas were thrown around. This hover scooter, unsurprisingly, never actually made it into production…but it was one of the coolest concepts to come out of that time period. It was little more than a seat and handlebars on top of a scarily loud fan. 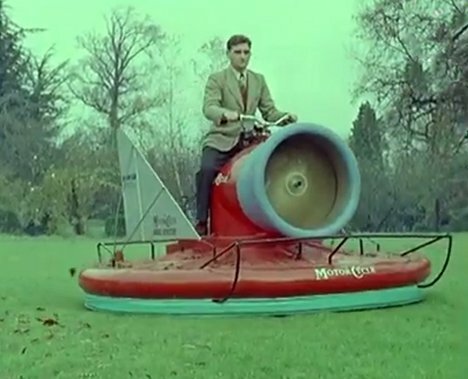 The spinning fan produced a six-inch cushion of air to keep the scooter just barely off of the ground, allowing it to hover over land or water with ease. We can’t figure out why these never caught on, because we’d drive the crap out of a hover scooter. See more in Epic Failures or under Vintage & Retro. April, 2012.